Intensity and duration are two of the major factors to consider when you custom-tailor your fitness plan. Running faster -- at a greater intensity -- can burn the same number of calories as you would if you slow down your pace and run for a longer period of time. According to the American Council on Exercise, it's essential to pick an intensity that allows you to run comfortably and safely. If you're asking yourself if you get better fitness benefits from quicker spurts of intense exercise compared to longer, less exhaustive periods, the answer is there are pluses to both. Before planning your fitness strategy, take a look at the U.S. Department of Health and Human Service's recommendations in the 2008 Physical Activity Guidelines for Americans. Most healthy adults should get at least 2 hours and 30 minutes moderate-intensity aerobic activity spread out during the week. The guidelines alternately indicate that 1 hour and 15 minutes of more intense aerobic activity, such as running, each week is also fine. The guidelines also suggest twice-weekly strength training sessions to keep your bones and muscles strong. The intensity at which you walk, jog or run makes all the difference in how many calories you burn per minute. The calories you burn during exercise also depends on your weight. Using ACE physical activity calorie counter, someone who weighs 160 lbs. burns 97 calories in 10 minutes running at a 5 mph clip (12-minute miles). If the same person ran twice as fast at a pace of 10 mph, he'd burn 194 calories -- double the number. You can expend the same number of calories by taking a longer brisk walk or jog than you would if you ran as fast as you were able for a briefer period of time. One variable to look at is time -- and how much of it you have to spend. 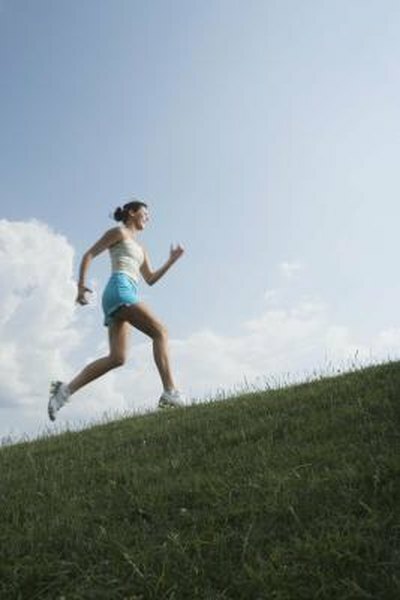 Another factor is if running, a high-impact, intense aerobic activity, is appropriate for your level of fitness. According to ACE, if you're obese or have a heart or orthopedic condition, it's generally best to avoid running. You can get the same calorie-burning benefits from talking a brisk walk for a longer period of time. A 160-lb. person uses up 276 calories walking at a moderately energetic 3.5 mph pace for an hour, the same as running for 20 minutes at a 7 mph clip. ACE suggests exercising at the intensity that feels most comfortable for you. As your level of fitness improves, you can graduate to jogging or running. Running can be an excellent way to get fit and shed those extra pounds, but remember that frequency, intensity and duration all matter -- as does the level of enjoyment you get from the activity. If you're tempted to run faster to get that extra calorie burn, be mindful not to overexert. You should run at an intensity such that carrying on a conversation for 30 seconds is difficult but not impossible. Make sure to warm up and cool down for three minutes before and after each run. Get your doctor's OK, if you've been sedentary for a long time or have medical conditions that might make intense aerobic activity dangerous. University of Southern California: Will I Lose Body Fat More Efficiently by Performing My Aerobic Workouts at a Low, Rather Than a High, Intensity?